Ever since we released our Prospects feature back in March, folks have been asking us for reports that summarize the Prospects info. Well, here you go! First, refresh your Gmail tab. 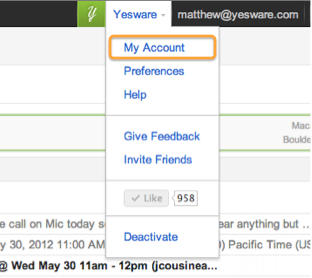 Then, from Gmail go to My Account from the Yesware menu and then select the Prospects Report. 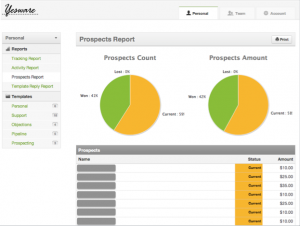 This report summarizes the state of your Prospects list as created in your Yesware-empowered Gmail. You can see I’ve greyed out the companies on my list and my amounts aren’t really in dollars, but you get the idea. Once we have our CRM sync working, we’ll connect this with your backend CRM. 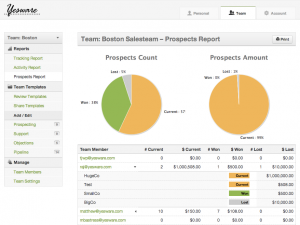 But for now you can use Prospects as a quick hit list of the deals you are working on. And when you want to show your boss what’s up, here’s a quick report for you to share. If your Team uses the Prospects feature, the team manager can see the total team Prospects info rolled up into this report. 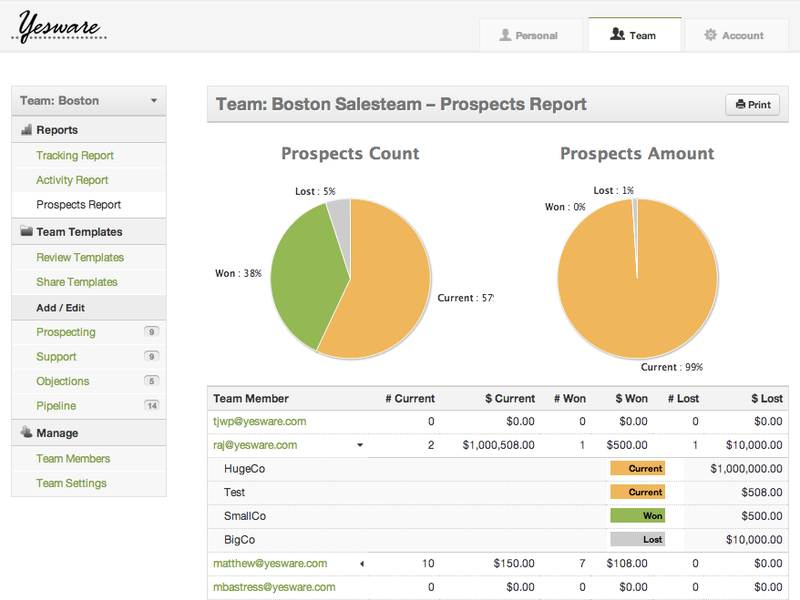 You can also drill down into each individual team member to see what deals are on their list. We’ve got several enhancement ideas to these reports, especially CRM sync and the ability to choose timeframes, but we’d love to hear what you think as well. Please post your feedback below or email us at support@yesware.com. And thanks!